This post could alternately be titled "Chicken with Parmesan Grits and Tomatoes." But considering the grits-splosion that occurred in my kitchen last night, I really prefer the original title. See, there are times in our lives when we have to ask ourselves one question. That question is: Am I going to do what I am told? Or am I going to do what I know is right? Never is the answer to that question more important than when you are talking about grits. As you may have surmised, last night I made chicken with parmesan grits and tomatoes. It was really, really good. 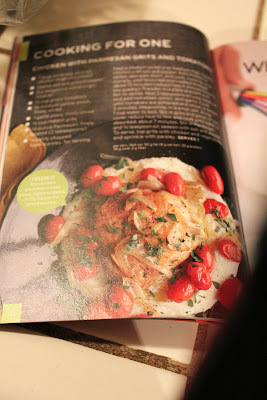 My husband loved it; he is pretty much the litmus test for whether or not a given recipe is going to be blogworthy. It was an Everyday Food recipe in the October 2011 issue, on the "Cooking For One" page. I doubled it (math!). Unsurprisingly, the recipe's not on their web site yet, so I'll put it at the bottom of this post. 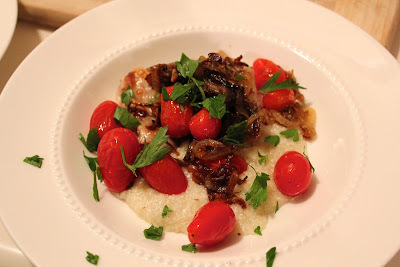 Grape tomatoes, grits, onion, garlic, parmesan, parsley, and boneless chicken thighs. This is important, now. The recipe calls for instant grits. If you have, indeed, purchased instant grits, may I suggest you follow the directions on the package rather than cooking the instant grits for SEVEN MINUTES? See, cooking instant grits for SEVEN MINUTES defies the very instantitude of the instant grits. 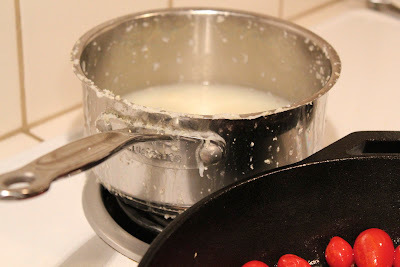 What I would do in this situation (and which I did after cooking the instant grits for SEVEN MINUTES) is to make the instant grits according to the directions on the package, and then throw in the parmesan and olive oil and salt and pepper. It turns out delicious! But that's just a suggestion. Then what you do once your grits are done is you slap them on a plate, place the chicken on top of that, place the veggies on top of that, and then sprinkle on some parsley. Voila! This was really fancy-looking and delicious. 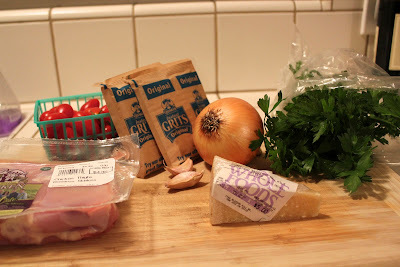 The onions had crunched up a little bit in the pan and all the flavors complemented each other so well. I highly recommend this! Makes 1 serving. Double or quadruple or whatever for your own purposes. Heat a medium skillet over medium-high. Season chicken with salt and pepper. Add chicken to skillet, skin side down, and cook, turning occasionally, until browned and cooked through, about 15 minutes (reduce heat if chicken browns too quickly). Transfer to a plate and tent with foil. In skillet, heat 2 teaspoons oil over medium and add tomatoes, onion, and garlic. Cook until tomatoes are softened and onion is tender, 5 minutes. (WARNING! WARNING! THIS NEXT PART PERTAINS TO GRITS!) Meanwhile, in a small pot, bring 1 cup water to boil. Stir in grits and a pinch of salt; cover, reduce heat to low, and cook until water is absorbed, about 7 minutes (OR YOU COULD JUST FOLLOW THE DIRECTIONS ON THE PACKAGE AND REDUCE YOUR MURDEROUS RAGE!). Stir in parmesan and 1/2 teaspoon oil; season with salt and pepper. 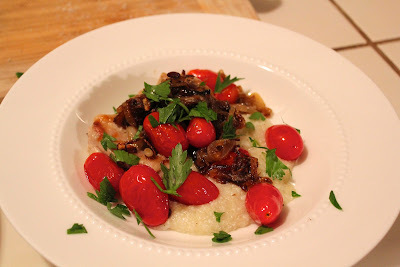 To serve, top grits with chicken and vegetables and sprinkle with parsley.